As a second-generation Italian, any show promising artisinal and fine Italian foodie and beverage delights is going to be a huge draw to me, but I’d gone along to the excellent Bellavita Expo additionally in the hope of finding some free-from products. And I did. Here were the best in show …. Fidani from Abruzzo make what they call ‘healthy sweets’ – cakes and biscuits, mainly. 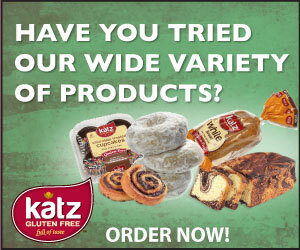 Not all are gluten-free, but some are, and others are free from other allergens, such as lactose / milk and eggs. They produce an artisinal gluten-free lattice crostata – very typical of many areas of Italy – made with grape jam, and pastry made with rice, almond and potatoes. It was delicious – as were the cookies I sampled. But the most noticeable string to their ‘free from’ bow was a range of nickel-free products. I know little about nickel allergy – a contact allergy affecting up to one in six women, as shocking as that may sound, caused by exposure to jewellery, zips, jeans studs, coins, spectacle frames and more. Those with nickel allergy are often advised to avoid foods high in nickel – such as chocolate, many grains, many legumes / pulses and dried fruits. Fidani told me the products were a response to a nickel allergic customer’s needs – they even go so far as to have the products tested for nickel in the laboratory, although I don’t know whether there are any official thresholds as this is not strictly a food allergen. Wonder whether we’ll be seeing this sort of thing in the UK, soon? … especially if free-from varieties make it to the UK. This one, by a lovely Veneto-based company called Pasticceria Fraccaro, who use sourdough in all their products, looked delectable and, as you can also see, they do a GF panettone too. They also produce vegan croissants. Vegan products, in fact, were what surprised me most at the Show. Among my extended family members and friends in Italy – I’m talking dozens and dozens – there’s not even one vegetarian, let alone vegan. I hadn’t appreciated that veganism had by stealth become a thing – at least in the more metropolitan areas, if not in the more rural areas. I came across a brand called Pasticceria Toschi with a vegan line of products – Vegan Cake – in kid-friendly packaging. They were a Lucca-based company – and, interestingly, when I visited this beautiful Tuscan town last year, I was struck by the number of GF and vegan menus attempting to lure tourists, so perhaps I shouldn’t be surprised that vegan brands are starting to make their mark. The cookies were delicious, too. More vegan products. Some organic dairy-free almond milk made with the Avola almonds by Genesis, which grow in a region of Syracuse in Sicily, and are reputed to be among the best almonds in the world. And some vegetarian pates made from chickpeas, lentils and black beans by Prodotti Bio Alberti. They were earthy and exquisite, with very few ingredients – all natural – and allergy-friendly. Some gluten-free filled pastas – such a huge range from a specialist brand called Pasta di Venezia, including radicchio (Italian chicory) and speck (a dark cured ham flavoured with juniper, from very northernmost German-speaking areas of Italy), and an unusual combination of pumpkin and cep mushroom (porcini). They also do flat pastas, teff pastas and teff gnocchi … yes, please. Finally, lactose-free / low-lactose was well represented by Nonno Nanni – a brand some of whose products are stocked in the UK by Wholefood Market, but have a far more extensive range of fresh and soft Italian cheeses that can only be enjoyed in Italy. The lactose-free spreadable cheese (below right) I was told is in the UK, but the lactose-free Robiola (left) is not yet. It’s delicious. Bellavita Expo runs until 20th June 2017 at the Business Design Centre, Islington, North London, and at other cities worldwide throughout the year. For more information about the event, click here. It wasn’t clear whether the pasta was corn/maize free. It zipped out of sight when I tried to click on it. Being both wheat and corn/maize intolerant – and hugely so – causes a lot of problems – and real dangers. But Chinese style rice noodles are not the same as proper pasta! I think a lot of Pasta di Venezia is corn and rice based, but they do have a few teff products. Unsure whether teff is blended with other flours, though. Are you struggling to find rice / corn / wheat free pasta? Hale & Hearty do a quinoa and rice one which is good. The pulse pastas – chickpea etc – are tasty, and there are a lot of them about now.